Your code must create the approximation, that is, don't hardcode or take data from the internet. The shape must actually look like a bell. This is a popularity-contest, so be creative. Because of the nature of the random number generation, it is possible to get an ArrayIndexOutOfBoundsException. I used multithreading to speed up the process. The program determines the number of processors available and creates that many threads to run the simulations. To obtain a finer image, NUM_DUST can be increased, but that would also lead to an increased risk of an ArrayIndexOutOfBoundsException. Each thread creates a new Random after every 1024 Dust objects are simulated. When that code was removed, the image was more coarse. rand.nextInt(21) - 10 is to widen the distribution. A change to rand.nextInt(3) - 1 would remove all chance of an ArrayIndexOutOfBoundsException. 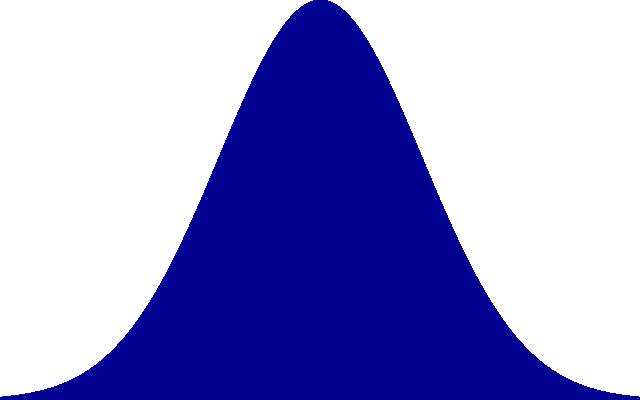 I decided it should not only look like a bell curve, it should look like a bell. So hey, let's spin it around the Z-axis and make it 3D. And hey, while we're at it, it should sound like a bell as well. So, each time you evaluate the code, it makes a nice pleasing church-bell BWONNGGG! And here's a brief video of the bell ringing. putStrLn "please choose the width and the maximum height:"
OK... that wasn't exactly fast. Here's another go. Does it still count as not hard-coded? 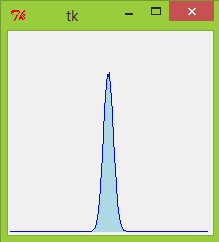 Simulates the classic example of bell curves, dropping a ball down a grid full of pole thingies. Oh, did I forget to mention it's upside down? 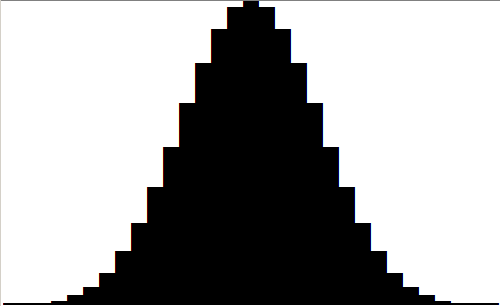 Generating the sums of 5 random integers, each between 0 and 100, 20000 times. Here's the result for sums of 1,2, 3 numbers. 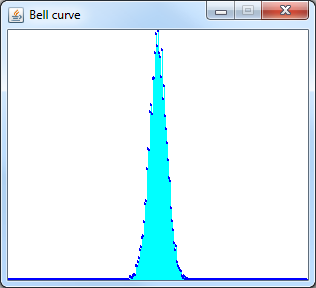 As the number of integers to be summed increases, the curve approaches the bell shape. 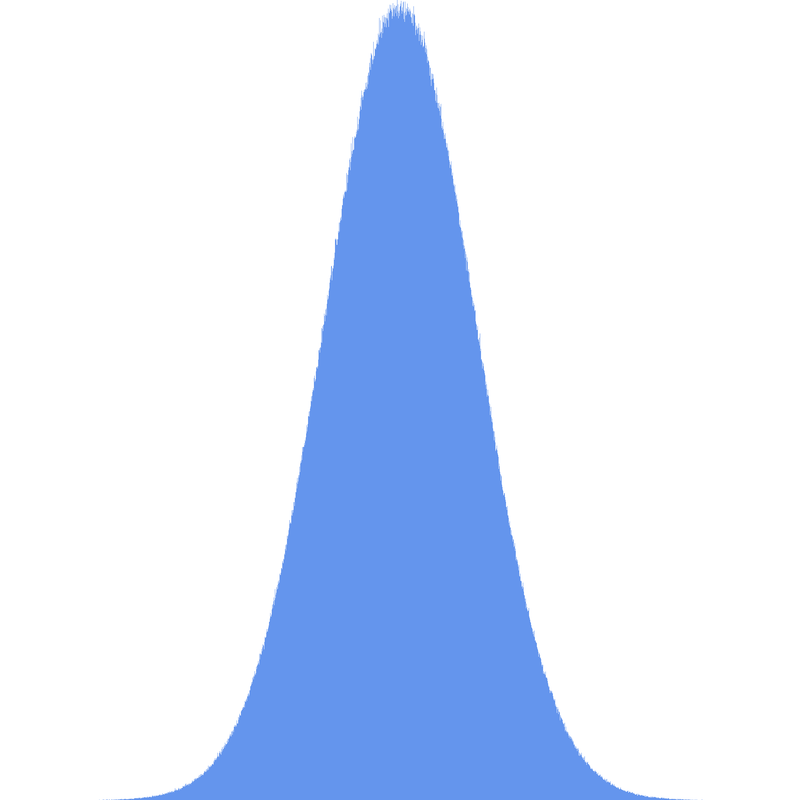 This is actually a normal distribution, using 2 as the base of the exponent instead of e, and not dividing by ⎷2π, because without axes, it doesn't really matter if the area under the curve isn't exactly 1. The last 3 lines just keep the window open until the user closes it manually. 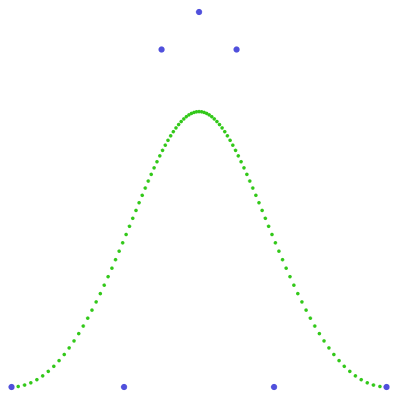 Rough approximation with a hand-crafted Bézier curve. To make it more interesting: No use of Line, Path or similar, only Ellipse. 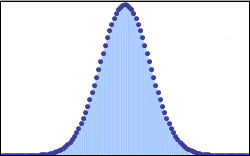 Here is a practical application of the Central Limit Theorem. I even golfed it! We can make the graph more and more bell shaped by adding more dice. I don't see this as taking my data from the internet since, if I could run the query engine for it on my home computer I would. 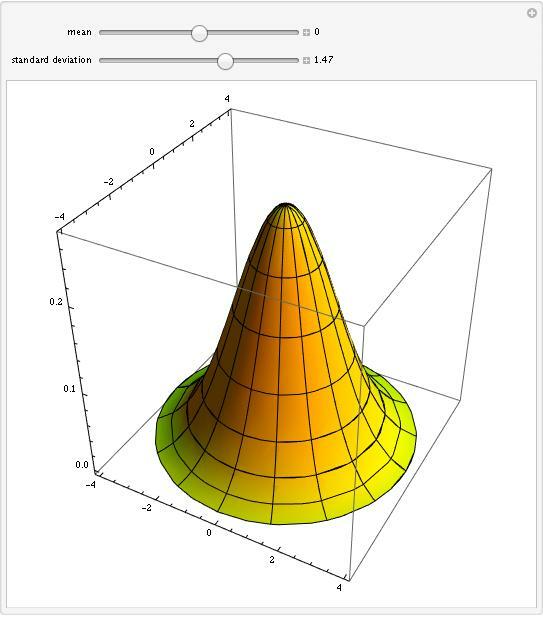 Unfortunately, Wolfram Research doesn't provide it for download, though. 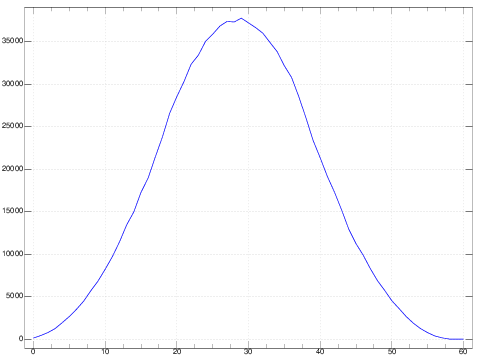 // I could have used Random.nextGaussian() method, but this way is more fun. I liked Doorknob's generation method and Victor's output (his generation is actually equivalent), so I decided to combine the two with tkinter! Then, make sure that you enable the sliders for the variables (if they are disabled, click on the circle next to the variable names). Then, you can set a value for them by sliding. 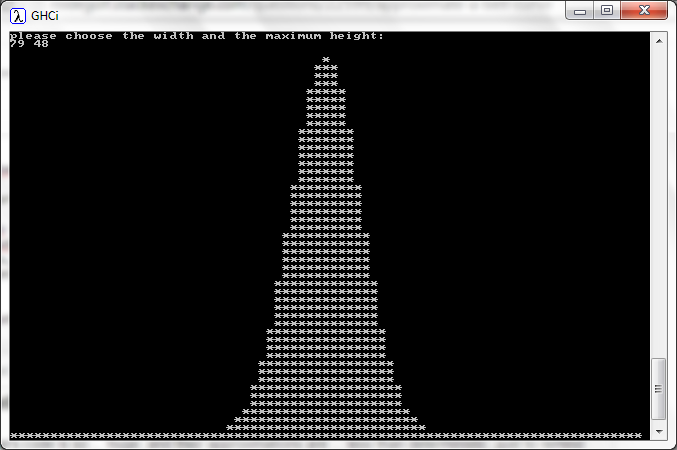 Throwing 6 dice in every possible combination approaches a 'normal distribution', which happens to be a bell curve. Not very creative, but still fun! Throws three twenty sided dice 1000000 times, summing the result each time. Then to get it in a plot-ready format, we take the array [3..60] and replace each element by the number of times it occures in the random sums. Instead of directly simulating coin flips, this just uses the observation that the pdf of a sum of random variables is the convolution of the pdfs of each of the random variables. An efficient way to do circular convolution is to take the inverse fourier transform of the element-wise product of the fourier transforms of the pdfs of each of the random variables. For the purpose of this problem (not true in general) circular convolution can stand in for linear convolution. 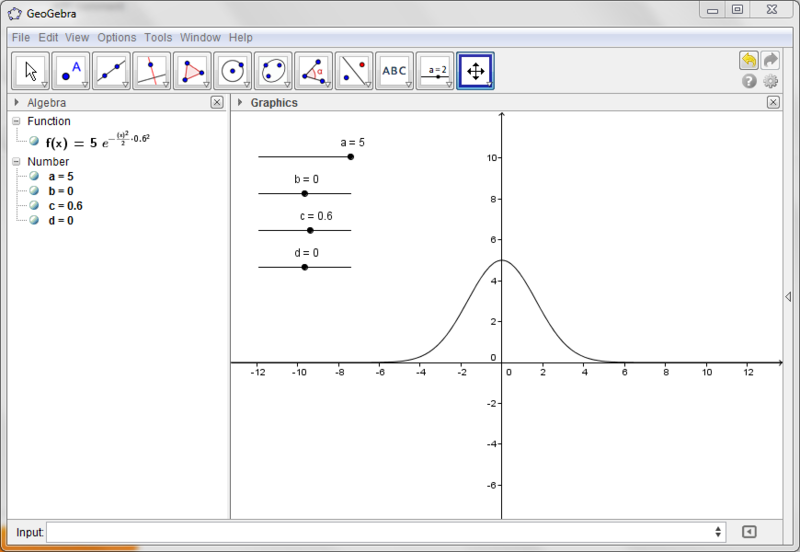 As an example, given the following pdf of a uniform random variable. The uniform random variable summed with itself 7 times. This isn't code-golf but I still want to give Stax a try. 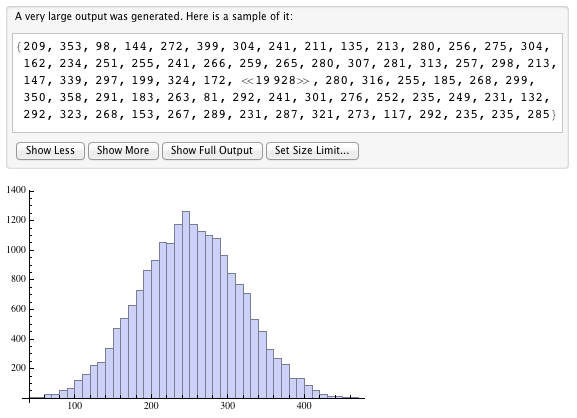 Calculates frequency of sum of dices rolled 6 times. Note there are no support for random numbers in Stax.